The other day I was driving along the familiar road between my home and Malmoe, and as usual passed the old Distillery. Every time I wonder why I do not take the time to stop the car and walk up to the old historic buildings…This time, I finally decided to return the next day – with my camera. And I was not disappointed. As usual, click to enlarge. 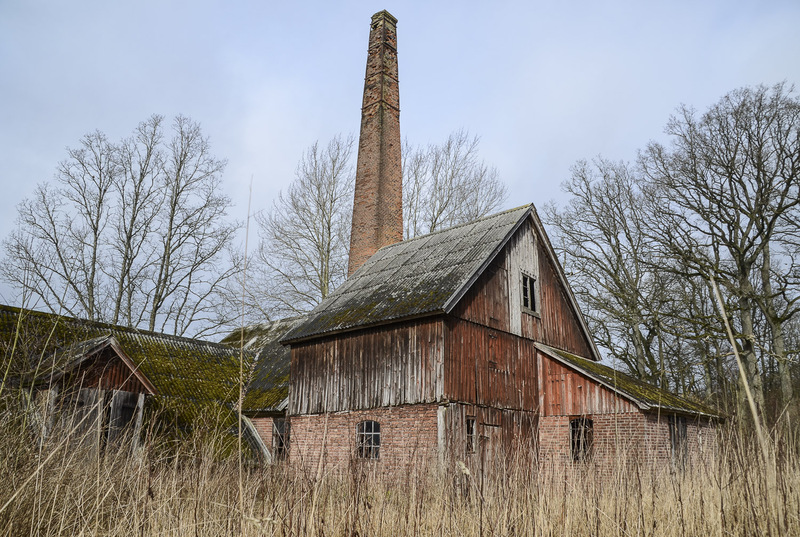 These are the weathered remains of one of the oldest Swedish distilleries – Sösdala Distillery, built 1860. The same year that Vladivostok was founded and Abraham Lincoln was elected president. And most important for this distillery, home distillation of alcohol was forbidden in Sweden. History in short says, that in 1766 the Swedish king, Adolf Frederick, decided to abolish all alcohol restrictions. This led to virtually every household making and selling alcohol. At the beginning of the 1800s, the Swedish people were drinking a lot of alcohol, from 175,000 distillers (most of them for household-production only), using tremendous amounts of grain and potatoes that otherwise would have been consumed as food, and it was later said that most men in Sweden abused alcohol. Women rarely drank alcohol, since it was considered inappropriate. In 1830, the first moderate drinking society was started in Stockholm. A few decades later, the first fully-fledged temperence organisation was formed, and in 1850, alcohol began to be regulated by the state. 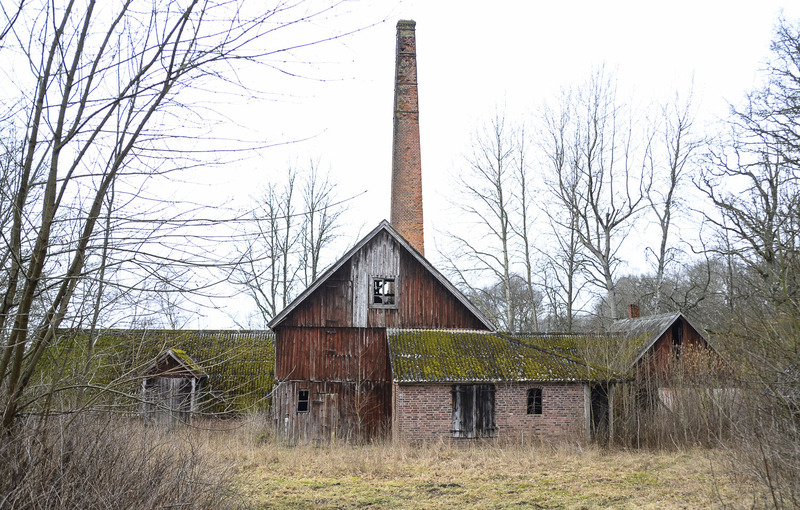 Sösdala distillery was shut down in 1950. It was forbidden to go inside, but I walked over the open space and up to the old buildings. Some of them weathered and some worn down to dilapidation. But all of them blending in with the surroundings, and being slowly and beautifully reclaimed by nature. The stillness in the air, the soft song of birds and the calls from cranes flying north this spring morning – made this a walk of harmony. Welcome to the challenge! – We are so looking forward to seeing your inspirational photos and thoughts! Also, Be sure to tag your post with Lens-Artists so that others can find you in the Reader. On next Saturday, March 30, Amy will post theme #39. Leya, what an enjoyable read and your photos are absolutely beautiful. Thank you! Thank you for commenting too. Glad you enjoyed the history as well! Where do I start . What a great post! So interesting .. 175,000 distillers wow! I too love old things, and these photos are fabulous!! A lovely comment to start my Saturday! Thank you – and wishing you a lovely weekend. Thank you so much, Sylvia – only wish I could have gone inside as well! But now I want to see what you have found for us! Thank you for a lovely comment – and I am so glad you found the challenge interesting! So, thank you, this was indeed a challenge for me. I am glad you mastered to write this and meet your challenge. Good words and photos for us all to remember. Thank you, Amy. No. 38 already! It’s been a huge success, this challenge, Ann-Christine, and much is due to your imaginative interpretations, and beautiful photography. 🙂 🙂 Is the abolition of alcohol connected with the high prices charged in Sweden? The temptations here are terrible! 🙂 🙂 🙂 Must be why I smile a lot! ;-D Then I suggest you keep on falling for those temptations! Yay – and better weathered and worn than not here at all! Sounds really magical! Thank you for joining in! And i am happy to pop over for it! Haha – well, if it is still standing! Well, better not leave it too long then! Here is my end of the road. Your lovely photos reminded me of mine that waited a year to be posted. Great excuse. Hi Manja – thank you for the excuse arriving! So glad you loved them – and thank you for joining in the fun! So glad you enjoyed them! I quite agree about old buildings. I will pop over! Fascinating post. Love the photos and the history about drinking. Coca-Cola was marketed in 1906 as The Great National Temperance Beverage. Thank you, Marie! And thanks for the information about Coca-Cola – that, I had never heard of! What great photos you have for weathered. Glad you like them, Cee! Thank you for joining in! A wonderful theme with many possibilities! I love the way nature moves back in to beautify what man has left behind. Yes – nature hopefully conquers us all! Thank you! So we have quite a similar alcohol history then. I must admit I had never heard of the Gin craze. I guess some hundred years ago things were more tough to survive. Much hard work and misery – no wonder they tried to forget about it with the help of alcoholic fogs. What a poetic and beautiful description of the images! Thank you very much, Laura. So glad you like it, and love it too, Xenia! Thank you for joining in! Thank you, David – quite fascinating about life here some hundred years ago. Interesting theme and wonderful examples Anne-Christine. Your shots feel quite rural and forgotten in a way. I wonder how old the structures are as they’re still standing quite well. Thank you for your comment – and for joining in! Great post and an idea for a challenge. Those photo’s are great too – what an interesting looking building. Thank you – glad you found it interesting! Yay, happy you are one of those too! And doors can be very, very beautifully weathered and worn. Looking forward to your entry! Thank you again! Sometimes it might not work as it should! Beautiful photos of a wonderfully aged structure. These old buildings are so charming, and the stories of alcohol and Sweden are something I really like to collect. So glad it resonated with you! And the stories behind as well! Thanks for the lesson in history! Pity that beautify old place should be left to go to ruin! I’d love to restore it and live there… and make beer! Loved your photos and your story this week Ann-Christine. The images really speak to the passage of time. Can’t imagine you passing it by!! Thank you, Tina – neither can I…My only explanation is that the factory is situated on a very heavily trafficked road between two busy cities. Not easy to find ones way out to it from all the traffic. Great! Glad you love it! Thank you for joining in! And yes, going inside is usually well worth it – if it is possible. Thank you, Mandy. So much we learn from searching facts about the photos. what a cool place for a photo shoot. I bet this distillery was hopping and bustling during its prime time. and quick question for you – I heard that in Sweden some folks are getting the chip under their skin – for I.D. A Chip? I wouldn’t want one even if I was offered one. That’s what we do to our pets! And yes, a cool place – sorry I did not stop there some years ago when it might have been allowed to step inside! 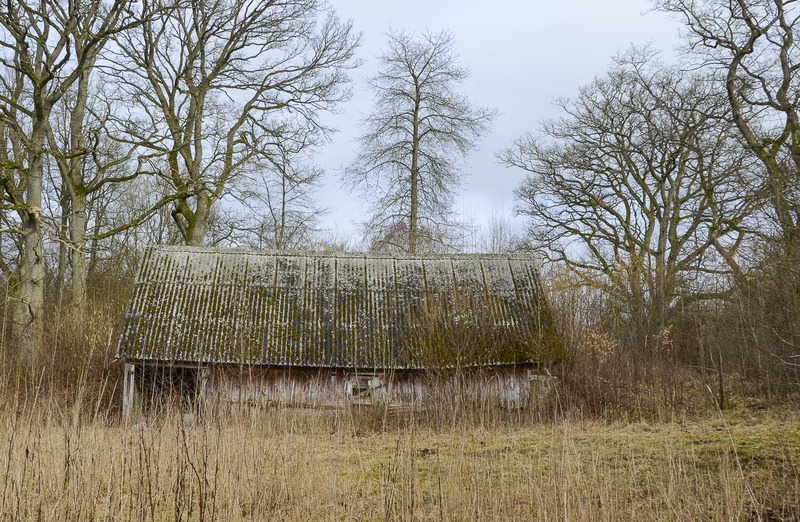 I love abandoned buildings and you’ve captured these so well, Ann-Christine. Glad you liked them, Jane – and so glad I finally decided to stop for a visit. I love the idea of these buildings being reclaimed by the land. I really see that through your photos – with those shots of the moss-covered roof and various views through the grasses. And such a nice description of the harmonious feel of the place! I, too, would never have considered the connection between food and alcohol production. Interesting! And thank you so much for your shout-out from last week’s challenge. That is so kind and so generous and I truly appreciate you! I was outside today among this crazy rocky landscape of New Mexico and got some inspiration for this week’s challenge. So I’ll be back!!! Mmm, thank you for your kind words – my Sunday already feels good! Welcome with your post – looking forward to it! Nice challenge, Ann Christine! Great history in your post. Thank you! This weathered buildings are beautiful via your lens, A-C. Thank you for the historic information. Thank you, Amy, glad you like them! I always wish that old people would be loved for getting old as well. Maybe that is why I like weathered and worn things? As to the history of the place, I find it rather interesting. I did not know alcoholic beverages were that common in Sweden back then. Fortunately it has changed. Thank you kindly, dear Suzanne – I’m off to yours! Still beautiful even in decay. The history was fascinating to read too. I am glad you liked the post. Some new facts to me too. Thank you so much for your positive comment! I never thought of it as a photogenic building, but maybe you are right. I really like that type of old building. Here we have a few old breweries and hop kilns that have a certain charm. Are they still in use? Not usually. Speights Brewery in Dunedin is, it’s been going since 1876. I haven’t done the tour (now I think I should). Seems they have an old brewery and a new one and you tour both, see https://www.dunedinnz.com/meet/conference-venues/event-services/speights Nigel’s reminded me kilns down here are old lime kilns duh – I’ve seen hop kilns in the Nelson region. Thank you for the link too! Love old buildings like these, and this one has so much character. Then there are at least two of us! They are hard to resist, the old weathered buildings, but it took at least 5-10 years before I stopped the car for this one…I bet you have lots in Ireland as well! A beautiful post, AC with some great historical details too. I did not realize that temperance had an impact on food consumption and availability. Fascinating. Your shots have great lighting and texture. Thank you, Patti! I must agree, I had never though about the connection to food consumption and availability either. It is fascinating what a simple decision to stop the car and photograph these weathered buildings brought in of new knowledge. And that is only one of the good things with being curious. I wonder about the Finnish history too. In Sweden there is a saying about the Finnish alcohol consumption being much higher than in Sweden – would love some facts on that! It might be the same saying in Finland about Sweden – you never know. And about the tininess, yes, it probably was not that tiny back then. And people were smaller! Thank you – I will pop over to you. A great history lesson thrown in among the beautiful photos. Temperance was a big deal in the US, I learned (while working at the living history museum), especially for women. I hadn’t thought about the resources being used for alcohol instead of food. The US had much greater resources for food production, naturally. But the effect of domestic abuse on women and children due to alcohol consumption was behind the temperance and suffrage movement. It is an interesting thing, the story of alcoholic beverages and everything that follows. I guess we had about the same reasons here. I read that so many business owners were complaining about their employees being drunk, that home distilling was banned. Domestic abuse might have been the same here too, but I did not know it was behind the suffrage movement.